Bed with a Blade – Yes, this trip involved an unexpected blade – a 12-inch knife — found under my pillow as I nestled into my bed at a mountain cabin we found on VRBO. While the knife freaked me out, what shook me up even more was the idea that the sheets more than likely had not been washed. And that was only the beginning of the escapades that impacted our family weekend getaway to Lake Arrowhead, Calif.
We had brought our wonderful pet along with us, and the winding road up the mountain didn’t sit well with his stomach. Diarrhea, and a lot of it, ensued. To make matters worse, the owner’s maid service not only didn’t leave any clean towels for us for our stay, but also didn’t provide laundry detergent to wash the dirty towels that were strewn on the floor next to the washing machine. This discovery was made late at night – far too late for a grocery store visit. And as snow began to fall, we also discovered that there was no way to light the fire – no matches to be found, and no lighter either. On top of it all, the power went out. In spite of all our troubles, it turned out to be a fun getaway with lots of memorable time spent in the snow. Upon calling the cabin owner, he said, “Some people expect luxury. This is just a mountain cabin.” I don’t consider clean towels and matches to be luxury items. How about you? The owner eventually agreed and we were refunded for a portion of our stay. 2. 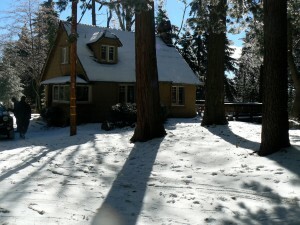 Electrified Lodging – Another mountain cabin, this one found on HomeAway, also made our “worst lodging” list. While it didn’t involve any sharp objects, it did entail some rather shocking experiences. The entire upstairs seemed to be electrified, and any contact with a bed, a lamp or even a wall led to a powerful shock. In fact, my husband thinks he may have been electrocuted as he went to plug in a floor lamp. The shock was so strong he felt as if it traveled right to his heart. He recovered fairly quickly, but the fearful look in his eyes was one I’ll never forget. Later that evening, he fell down the stairs, but quickly bounced right back up. My son kept referring to this Big Bear cabin as a haunted house, saying it almost seemed as if my husband was pushed down the stairs. Again, our weekend away turned out fine, and we’ll have happy memories of our time on the mountain for years to come. But after the first night of shock and awe, we decided to spend as little time upstairs as possible. 3. Mad Dad Motel – One thing I’ve learned is that Spanish fathers do not like their daughters to come home after curfew, and this was quite apparent in the hostel where we spent three nights in beautiful Sevilla, Spain. The owner’s daughter returned to the house late one night, only to find that her father had locked her out. For the next several hours, we were privy to a conversation that I can’t get out of my mind. The daughter repeatedly begged her father to let her in, imploring him to unlock the door over a timespan that seemed like hours on that rainy Spring night. Bu the father steadfastly refused. At some point I fell asleep amidst the argument, which was happening right outside our window. I’m not sure what the outcome was, but we suffered through a rather sleepless night. Sevilla was magical, however, and the hostel by no means took away from our wonderful trip. 4. Cockroach Condo – Imagine a stay in beautiful Kauai — in a beachfront condo with views for miles. I had been eyeing this condo development for a few years, admiring its location on a ridge above one of the most stunning beaches in the Princeville area of Hawaii’s “Garden Isle.” But within a day of our arrival, I came down with a bad virus, which ultimately turned into pneumonia. Instead of spending my days relaxing on that beach, I spent them on the couch, only to discover that I wasn’t alone. Indeed, a small army of cockroaches also resided in that condo. And my proximity to the ground for that entire week meant that my mind was focused (as focused as it could be with pneumonia anyway) on their every move. While we won’t publicly name these accommodations, rest assured, we did notify the owners of our dissatisfaction. The good news is that, overall, we’ve had many more vacation “hits” than “misses.” Our favorite lodging finds around the world — from New Zealand, to France and the U.S. and beyond — delighted us not only in their beauty and locale, but also in the customer service and attention to detail we enjoyed. What was your best, and worst, vacation rental experience? If you have any questions, or if you have travel ideas you'd like us to write about, please fill out the form below or contact us by email. Copyright © 2011 - 2019. SavvySojourns is a property of Paula Johns Communications, Inc. All Rights Reserved.